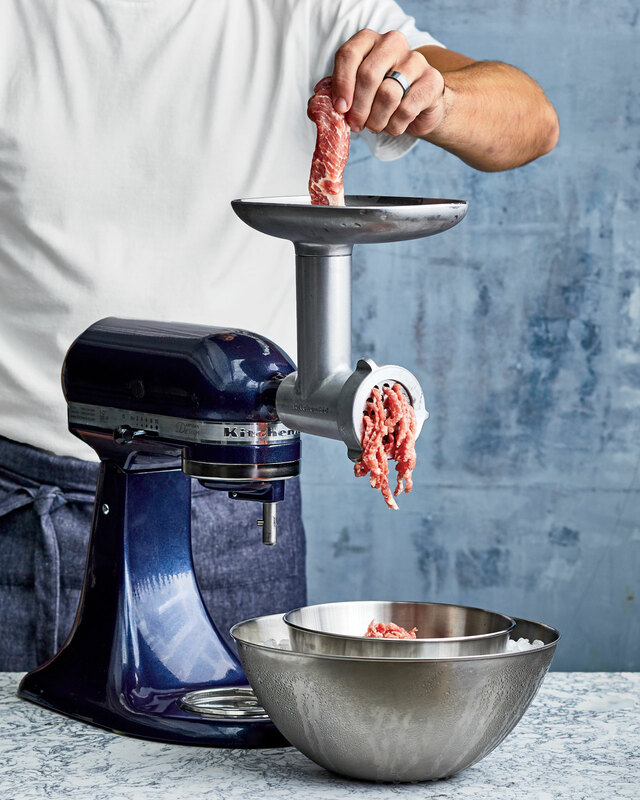 Learn the basic steps to grinding meat. 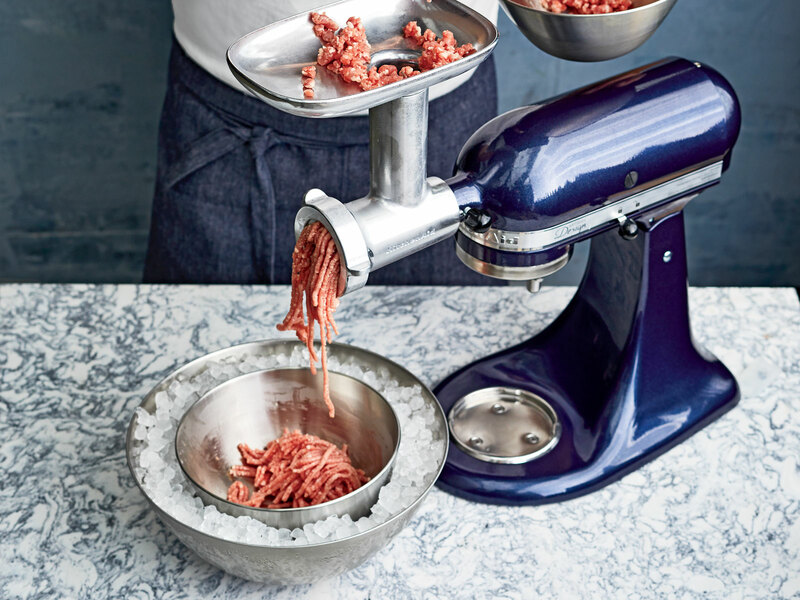 The secret behind the best restaurant burgers, sausage, and meatballs is simple: freshly ground good-quality meat. 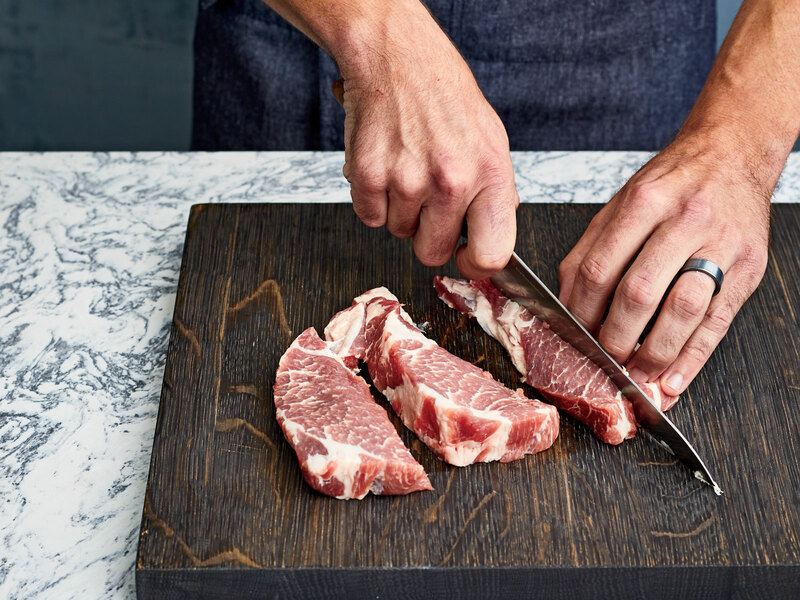 Purchase whole cuts of beef, pork, or lamb from your butcher, then season and grind the meat at home for total control over the flavor and texture. 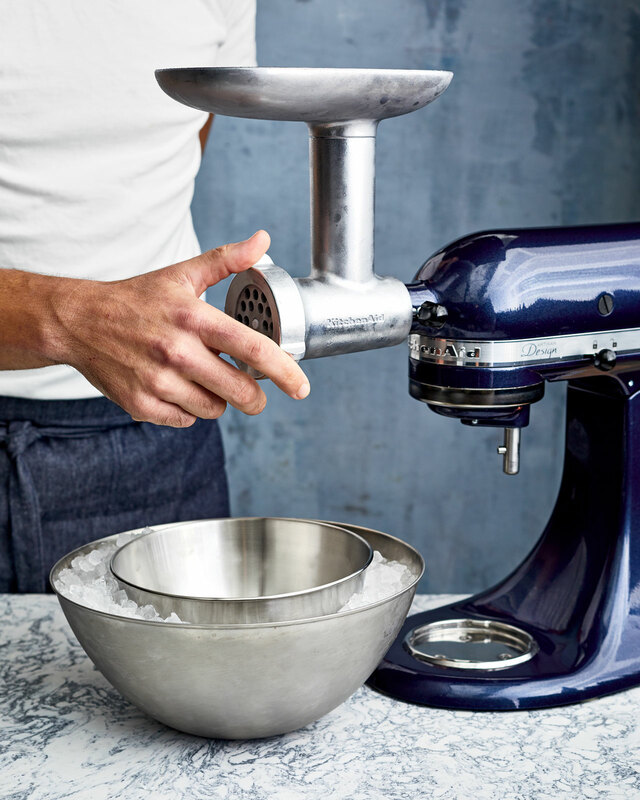 A meat-grinding attachment on a stand mixer makes the process quick, and cleanup is a snap. Par-freezing the meat and attachments ensures the meat stays cold through the process; it’ll get ground uniformly and remain food-safe. Learn the basic steps, then try different recipes to experiment with types of meat, ratios of lean to fat, and a variety of seasoning profiles. Cut meat into 3-inch-long strips about 3/4 inch thick. Strips are better than cubes because they feed smoothly through the grinder, ensuring the process goes quickly and the meat stays cold. Place the clean, dry grinder attachments in resealable plastic bags and freeze. 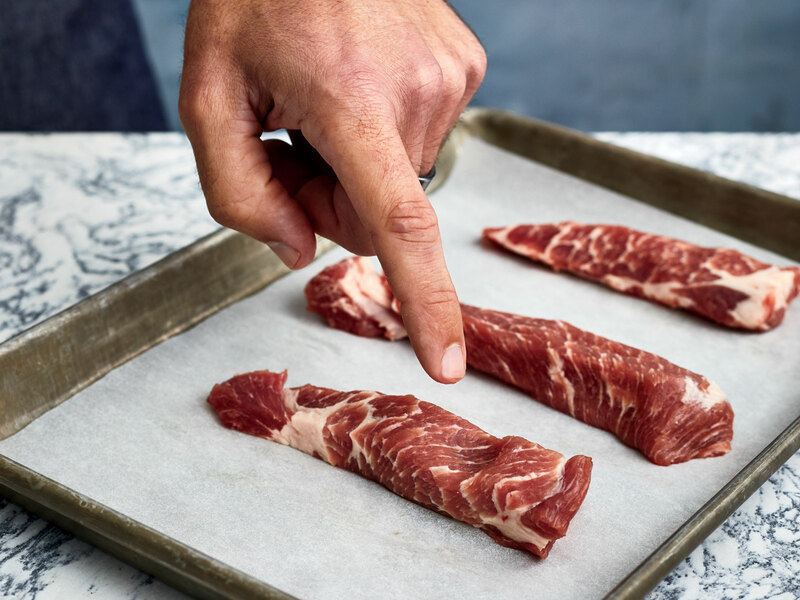 Freeze the strips of meat on a baking sheet until the meat holds a fingerprint without bouncing back, about 30 minutes. Assemble the chilled grinder with the coarse grinding plate. Place a medium bowl set inside a large bowl of ice underneath the grinder to catch the meat and keep it cold. Set stand mixer to medium speed. Pass meat strips and any seasonings through the feed tube. Fold gently with a spatula to combine; refrigerate meat while assembling grinder with medium or fine grinding plate. Regrind meat through the medium or fine grinding plate, depending on desired result, by gradually “raining” the coarsely ground meat into the feed tube, pressing with the food pusher only as needed. Stop here for burgers, meatballs, and coarse sausage. 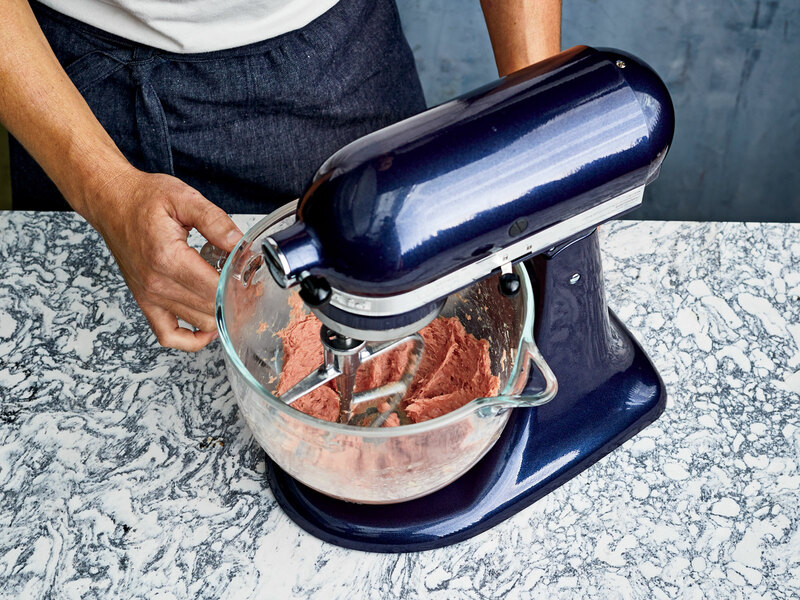 For finely ground sausage, knead ground meat in the chilled bowl of a stand mixer fitted with a chilled paddle attachment on medium speed, scraping down sides of bowl during first 30 seconds, until meat is tacky and smears sides of bowl, about 3 minutes.